Some companies claim one method is more environmentally friendly than the other. In reality neither are particularly environmentally friendly though we at DIY Marquees have changed to a more environmentally friendly galvanising system a few years ago and are looking in to an even better step in the future. We have even seen some companies claim (always towards whichever system they don't personally use) that one of the coating methods is acidic or harmful to users. This is of course absolute nonsense. Carports around the world use powder coating, all scaffolding and large industrial marquees use galvanising. Neither are acidic or harmful to use. To show that we are not alone in using galvanised steel the below photograph is of the Showmans Show, the only UK trade show aimed at the marquee hire industry. 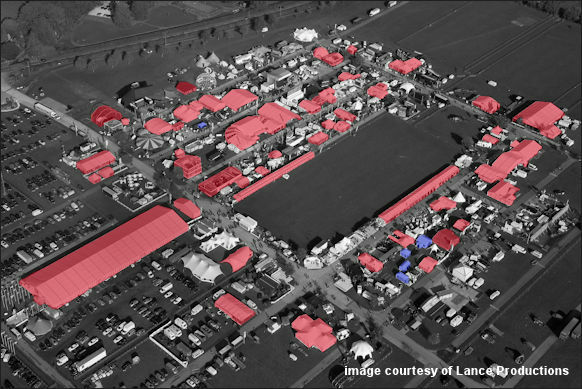 Marquees shaded in red use galvanised steel on its own or in combination with aluminium. Those shaded in blue use powder coated steel. Just about everyone in the marquee hire industry uses galvanised, not powder coated steel. It is simply more suited to purpose.